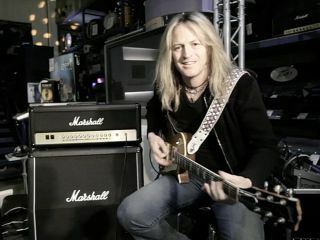 Back at the tail end of 2011, Whitesnake guitar star Doug Aldrich and drummer Brian Tichy hosted a Q&A and performed at Nevada Music in Portsmouth. Rhythm magazine were on hand to record a series of video lessons with Brian - his John Bonham-themed video lessons kick off here. Marshall fan Doug took the time out to talk us through the company's JMD:1 amplifier that was part of his live rig throughout Whitesnake's 2011 world tour. Naturally, he played a few classic Whitesnake riffs in the process... check out the video.